Georgia ranks high on many travel wish list right now. The Eastern European country, not the state, that is. The beautiful country, which is only about the size of West Virginia, sits at the crossroads of Europe and Asia. It was an independent kingdom until the Russians arrived at the beginning of the 19th century. Russian rule turned into Soviet rule, and the country didn’t gain its independence again until 1991. Even then, fighting continued over the regions of Abkhazia and South Ossetia. A true resolution still hasn’t been reached. But that hasn’t stopped tourists from exploring Georgia’s beaches, mountains, and hillside churches. Georgia is also one of the oldest wine-making countries in the world. Kakheti, the eastern region of Georgia, is both the most visited and premier wine-growing region in the country. Many compare it to Napa Valley thanks to its golden hills, consistent weather, and hearty wines. Fortifications, castles, and monasteries surround the main town of Telavi. Small vineyards extend all the way to the Greater Caucasus Mountains. 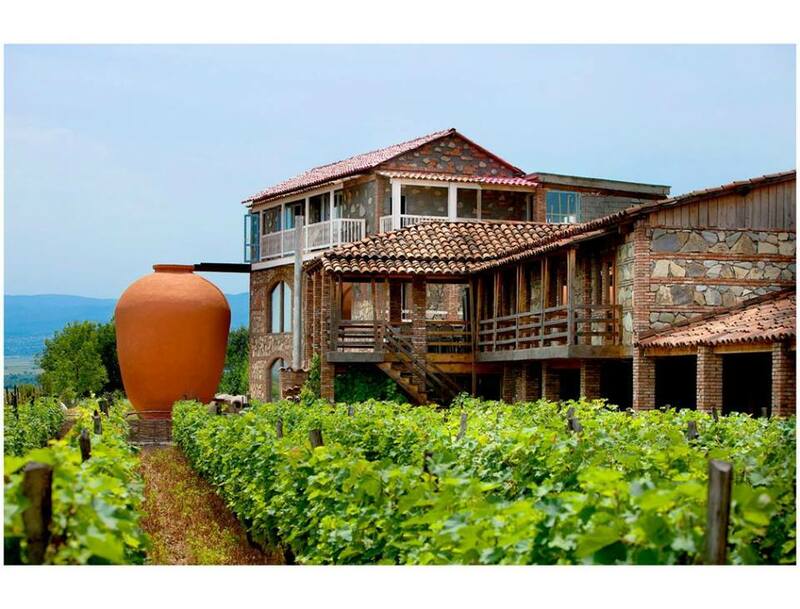 Today, you’re driving north to Napareuli to learn how Georgian wine was traditionally made. Napareuli is a small town known for its churches and quarries. Marble from the latter was used in the Warsaw Metro. It’s also home to Twins Wine Cellar. The vineyard is in the Alazani, a valley in between the Alazani and Lopota rivers. It features Qvevri and Qvevri Wine, the best wine museum in the region. The restaurant serves feasts that include Imeretian cheese, ajapsandal (eggplant with vegetables), chkmeruli (chicken in a garlic cream sauce), and plenty of Rkatsiteli and Saperavi wine. While a two-story kvevri, the largest in the world, soars over the property. These egg-shaped vessels are where wine was fermented and aged for centuries in Georgia. After eating and drinking all afternoon, the last thing you want to do—or should do, for that matter—is drive back to Telavi. Luckily, there’s a lakeside resort just a few minutes away from the winery. 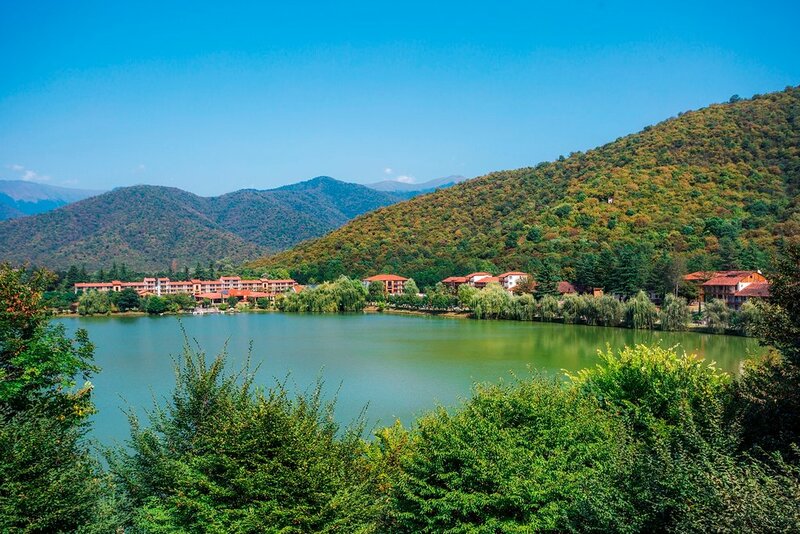 Lopota Lake Resort & Spa surrounds Lake Lopota, a peaceful spot in the foothills of the Caucasus Mountains where ducks like to congregate. In its former life, the resort’s main buildings were part of a Soviet printing plant. Don’t let that stop you. The red-roofed buildings are now surrounded by greenery. Modern rooms feature balconies with lake views. The Forest Spa is, indeed, hidden in the forest. While the food and the wine continue to show off the area’s traditions. So what’s first on your agenda? You could relax in the Russian sauna while a venik (a bundle of oak twigs) is massaged over your skin to boost circulation. You could learn how to make local bread in a tandoori-like tone oven. You could paddle a boat over the lake or a bike around it. You could enjoy the perfect setting from the outdoor jacuzzi or the open-air Lounge Bar. Or you could visit Chateau Buera, the resort’s own vineyard, to taste more of Georgia’s delicious wine. Wine is, of course, the winner.